Greetings ladies and gentlemen! It feels real great to be writing again. Sorry for the long absence! I have recently got a lectureship in Universiti Tunku Abdul Rahman (UTAR) in Kampar, Perak (Malaysia) and I had spent some time settling in (actually I couldn’t think of anything to write :p). A macro shot with a smooth and creamy background can attract a lot of attention. This is because (i) the clean background will less likely divert a viewer’s eyes away from the main subject of the photo and (ii) everybody loves bokeh! Learn more about getting natural, creamy backgrounds below. A male Double-striped Carrhotus (Carrhotus viduus). 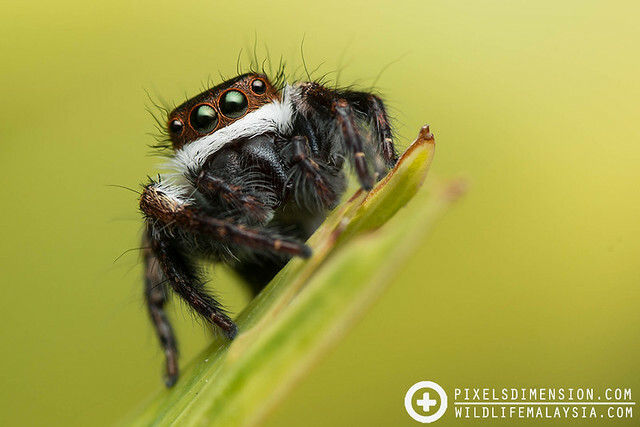 The smooth and clean background helps attract attention towards the main focus of this photo- the cute jumping spider. Granted, it is actually very easy to get a macro shot with a smooth and buttery background blur during daytime. This can be done by (i) Taking a macro shot without using flash and (ii) using an artificial background (basically bokeh printed on paper) displaying your very own, customizable bokeh patterns. A female Banded bullfrog (Kaloula pulchra). This shot was taken using a 105mm macro lens under natural light. As you can see, the background blur is smooth as silk. However, this shot is only possible as the frog was very cooperative and not moving a single bit. The method I wanted to share with you today is a whole lot simpler since it basically involves the manipulation of Depth of Field (DOF), no extra gears needed! 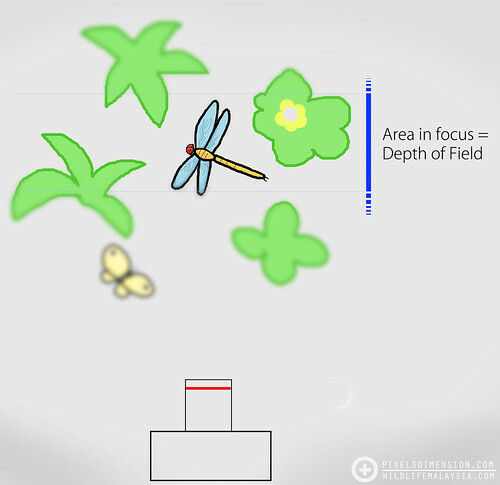 DOF is the distance between the nearest and farthest objects in a scene that appear acceptably sharp in an image. This can be easily illustrated with a simple picture below. 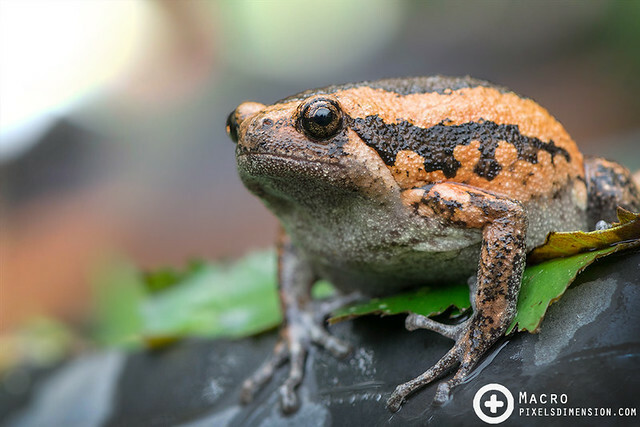 Learn more about DOF and how to overcome it in Overcoming Shallow Depth of Field in Macro Photography and Focus Stack to Overcome Shallow Depth of Field. Depth of Field (DOF) is basically a perpendicular plane in front of the camera which is decently to perfectly in focus. Note that due to DOF, only the dragonfly is in focus. PS: I apologize for the superbly awesome drawing. After a few sessions of teaching in both Macro Photography and Portrait or Casual Photography, I noticed that many are still not very familiar with DOF. Yes, most beginners were taught to shoot landscapes with small apertures simply because “they have to” or “it is the right way to do it” (assuming you want a landscape shot that is sharp throughout). The same applies for portrait shots, where they “should be” shot with the widest apertures possible to maximize bokeh (assuming you want a portrait with background bokeh). However, most are not really sure why they have to do this, and whether there are other ways of doing it. Many have the impression that DOF is affected solely by aperture, which is of course, not true. 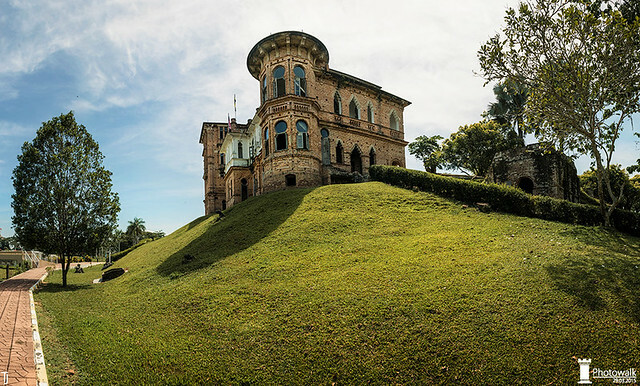 A panoramic, landscape shot of Kellie’s Castle in Perak, Malaysia. You don’t always have to use specific, fixed aperture values for a specific type of shot. 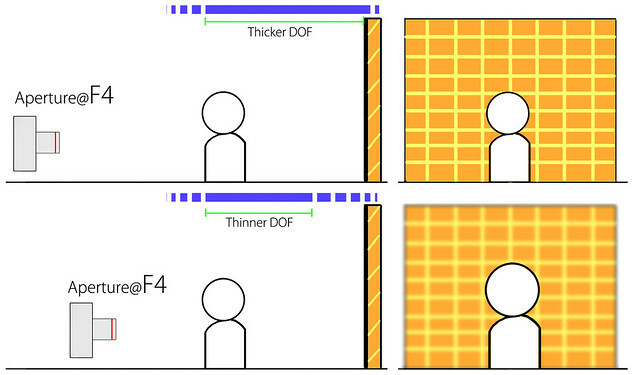 The fact is, DOF is not only affected by the aperture (F value), it is also governed by your distance from the subject. Bokeh, on the other hand, is affected by your aperture value, your distance from the subject, and the distance of the background from the subject. By getting these right, you will experience a huge leap in terms of photography skills, which is of course, not only applicable to Macro Photography. To give you an idea of how DOF is like, let’s take a look at some examples (using non-macro scenarios for easier understanding). 1. For a landscape shot with no subject in the foreground, you can actually get everything sharp regardless of whether you shoot at F2.8, F7 or or the way to F16. Knowing this will help you take better handheld landscape shots since you do not need to bump up ISO that much. 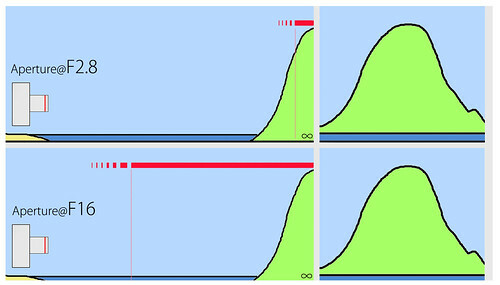 Decreasing aperture opening (increasing F value) will increase the Depth of Field (DOF), but it is not always necessary. For a normal landscape shot with no foreground, it doesn’t really matter which aperture settings you use since at a range of infinity (very far away), everything will be in focus- both photos on the right are essentially the same. However, if there is a subject in focus in the foreground (say a ship or a person), then a small aperture (high F value) will be required to ensure that both the subject and the background are in focus. 2. You can actually get more bokeh for a portrait (or equivalent) shot by standing closer to your subject. This is one of the major tricks for Macro Photography. For a subject at a fixed distance from the background and photographed with a fixed aperture setting; you can actually decrease DOF and thus increase the amount of background blur (bokeh) by standing closer to the subject. 3. You can also get more bokeh for a portrait (or equivalent) shot by increasing the distance of the background from your subject. This is especially useful in Macro Photography if you take photos using subject displacement, as covered here: Taking Photos that People Like. For a subject with a fixed distance from the camera (and photographed with fixed aperture settings), you will get more background blur (bokeh) if the background is farther and outside the DOF. Now that you know what affects DOF, let’s get back to Macro Photography. Although it is a good, fixed setting for beginners, you don’t always have to shoot at ISO100, F16-F20, shutter speed 1/200-250 and a certain power of flash. If you use this setting all the time, you will often end up getting macro photos with properly-lid subjects, but with pitch black backgrounds. This is because the low ISO value, coupled with fast shutter speed and small aperture prevents the sensor from “detecting” the light coming from the background. This is especially true if the background is far away from the subject. An article has already been written on how to avoid getting dark backgrounds: 5 Ways to Minimize Dark Backgrounds in Macro Shots. 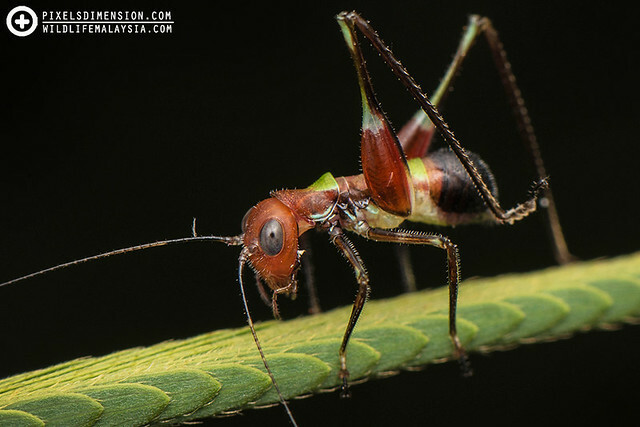 An Ant-mimicking Katydid. If the background is far away from the subject, one will not be able to properly expose it using the universal macro settings of ISO100-200, F16-18, 1/200 with flash. The background will end up being entirely black, as seen in this shot. Of course, there is nothing wrong with a background like this. Action 1. To decrease DOF and get more bokeh, I either (i) Get closer; or (ii) increase aperture opening (decrease F value). In general, for up-closed, highly magnified shots with minimal background, apertures of F16-F20 are desirable. However, if I am taking a shot from a distance, say a spider hanging in the middle of its entire web, I can actually decrease your F value to F5.6-F8 (variable depending on your distance from the subject, and also the size of the subject) and still get the whole spider in focus! 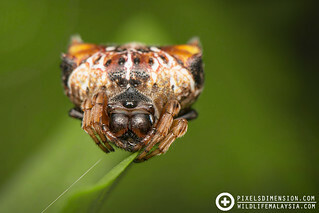 A female Double-spotted spiny Spider (Thelacantha brevispina). The closer you get to your subject in focus, the more the background is blurred. The focus of this shot was on the eyes of this Spiny Spider; however, the DOF was so thin that even the back portion of the spider became blurred out! 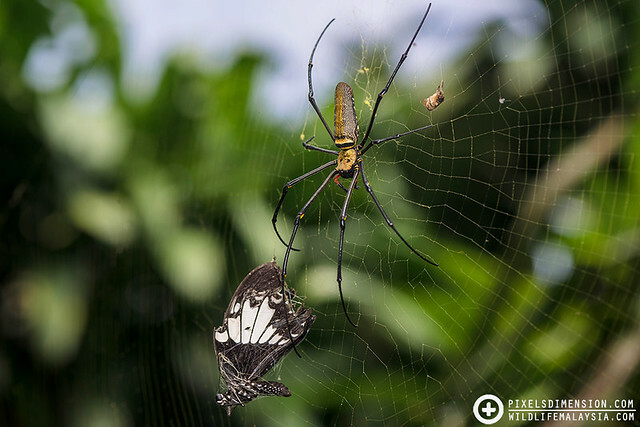 In order to accommodate both the large Nephila spider and its butterfly prey into the frame, I have to shoot from a longer distance. 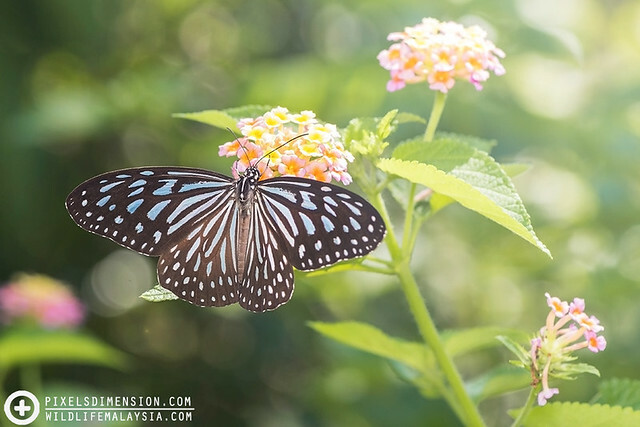 This shot was taken with an aperture of F6.3 which still managed to keep the spider and butterfly in focus. Shooting at this setting allows better exposure and background bokeh than shooting with the “default” or “universal” macro settings, which will give you an entirely black background. Step 1. Estimate the distance between the subject and the background. No, there is no need to literally measure the real distance between the subject and background; it is just a mere estimate that allows you to determine whether your flash will be able to lid the background and hence, be recorded by your camera. The measurement will come automatically after you are more familiar with your macro and flash systems. if the background is very close to the subject (e.g. some leaves behind the subject), it will probably be in range of your flashgun, which is all good. You can get a decent shot with the usual macro setting. Action 1 is applied to decrease DOF and get more bokeh. 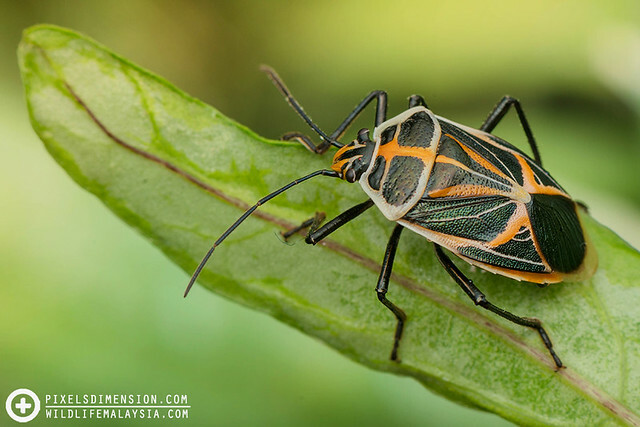 A Stink Bug (Hemiptera). This particular bug was resting on a leaf of a short plan. There were a lot of other leaves in the not-too-distant background (and within the range of my flash), so all I needed to do was to stick to the usual settings [Shot taken at ISO100, F16, 1/250, flash power 1/4] for proper exposure. I made sure that I get a bit closer to the bug to decrease the DOF, and thus increase the bokeh. If the background is very far from the subject (e.g. very distant trees or sky), my flash will not be able to reach objects in the distant background, I therefore have to compensate by giving the sensor more time to “detect” the light coming from the background. I will attempt to increase the amount of background light going into the camera sensor by (i) decrease shutter speed (my minimum is 1/100 without tripod; non-moving subjects); (ii) increase ISO value (my maximum is usually 640; YMMV). The dimmer the background, the slower shutter speed, and the higher ISO sensitivity is required. Again, Action 1 is applied to decrease DOF and get more bokeh. Step 2. Adjust flash power for proper exposure. Once you have applied Rule 1 and Step 1; if you fire a shot now, the resulting photo will probably be too bright or too dark if you are using default flash power (say 1/8 power; variable depending on your Macro Diffusion System). This is because the light entering the camera sensor has changed. For example, If you are photographing a subject with a distant background, and you have decreased your shutter speed to 1/100 and increased your ISO to 400 (to allow more light into the sensor), firing your flash at default 1/8 power will definitely overexpose your subject. This can be easily rectified by reducing the power by a few stops. Knowing which flash power to use will require experience and practice. But for starters, if the subject is overexposed, just decrease flash power; if the subject is underexposed, just increase flash power- simple as that! Getting the flash output right is the final step to getting a superb macro photo! The shot on the left is underexposed, the middle shot overexposed; the shot on the right demonstrates how the underexposed shot can be recovered using post-processing. It is important to note that an underexposed shot carries more details than overexposed ones. However, it is always best to get the exposure right in the first place! Your flash exposure does not have to be 100% perfect since you could always “save” your photos in post-processing if you shoot in RAW. However, it will be a good practice to try and get the exposure as good as possible to reduce potential loss of details. Also, do take note that it is easier to recover details from underexposed photos than overexposed ones. 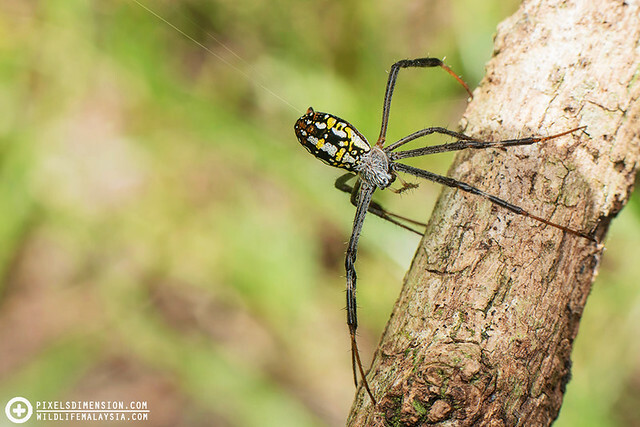 An adult female Dang’s Cross Spider releasing dragline silk (Argiope dang). Practice makes perfect. After numerous trial-and-errors, you will eventually be able to get the settings, and therefore the bokeh right! Okay, I suppose that is all there is to getting natural and creamy bokeh for your macro shots. It will require a little bit of practice when applying this particular trick; however, once you get the hang of it, you will be amazed how much it helps improve your photographs (not limited only to Macro Photography). Until the next article, Happy Macro-ing guys!